Figure 1. Northern Doji pattern. This article is devoted to the Northern Doji one-line pattern. The Northern Doji is a pattern belonging to the group of one-line patterns. Its basic candle is any doji candle type, except the Four-Price Doji because at least one shadow is required. An uptrend is required prior the occurrence of this pattern. Northern Doji may reverse the uptrend or slow it down. After pattern occurrence, it is recommended to wait for its confirmation. 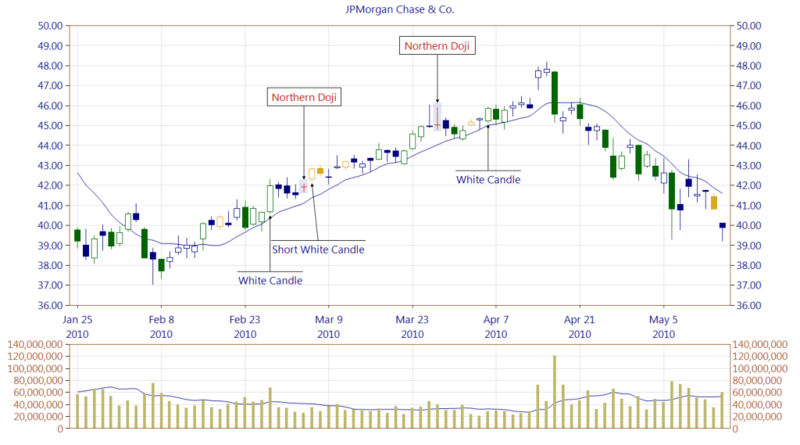 The Northern Doji pattern may occur on the same candle line in combination with another pattern, for example Bearish Doji Star, or on the second candle line with Evening Doji Star. Such situation reinforces the strength of the signal. The pattern composed of multiple lines is considered as a stronger one. Figure 2. 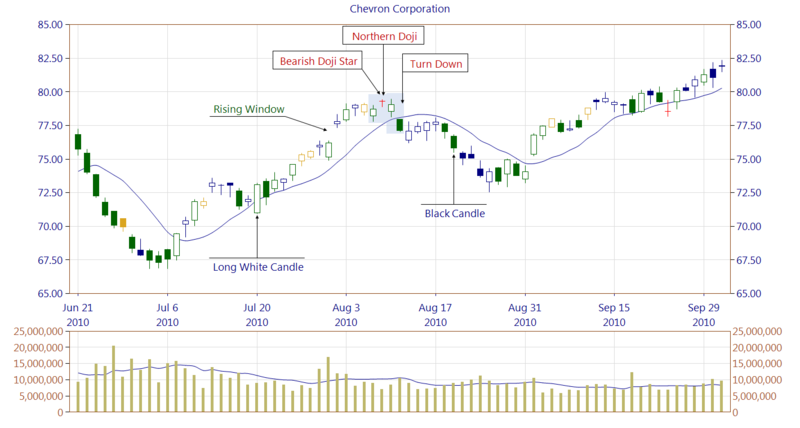 On the chart, we can notice a clear uptrend prior the occurrences of the Bearish Doji Star and the Northern Doji Star (being the second line of the Bearish Doji Star). The Rising Window pattern creates a significant support zone as it is confirmed by a high trading volume. After the Northern Doji, the Turn Down pattern is breaking the trendline, but further development of decreases is slowed down by the mentioned support zone. A few days later the Black Candle occurrence help to break it and move the price lower. The deeper decrease was stopped however by the Long White Candle occurrence. Figure 3. The chart presents two occurrences of the Northern Doji pattern. In both cases, signals were not confirmed. The first occurrence was negated by the Short White Candle. In the second case, the appearance of the Northern Doji pattern slowed down the uptrend, and even tested the support composed of three White Candles before the occurrence of the Northern Doji pattern. Finally, the pattern was negated by the White Candle. 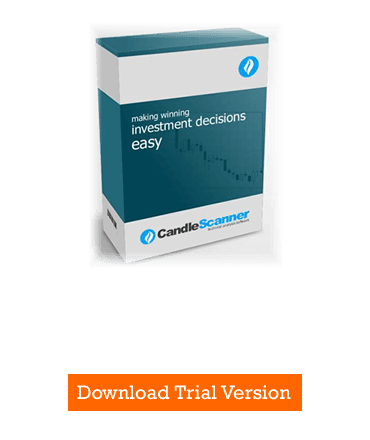 Below you can find some Northern Doji pattern statistics calculated by CandleScanner software. To see more detailed statistics, for other markets and periodicity try our CandleScanner software.